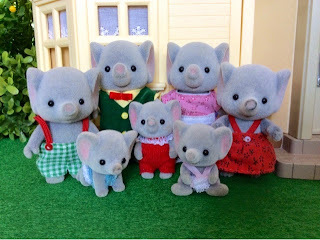 The Trunk Family is most probably Sugarbush Valley's most beloved and popular family, and are often referred to as the friendly bunch. They are always welcoming and helpful to everyone, and none of the other villagers can think of someone who doesn't like the Trunks. Both Father Hugo and Mother Savannah grew up in Sugarbush Valley. Father Hugo is a lumberjack by trade and his family owns a big lumberyard which is situated just outside the village, but Hugo was recently elected as mayor of the Village, and had to hand over the reigns to his younger siblings. Mother Savannah is a freelance writer and has published her first children's book recently. Savannah has a sister, Ella Ellwood, who lives in Whisper Wood. The Trunks live in Beechwood Hall, with their 5 children. 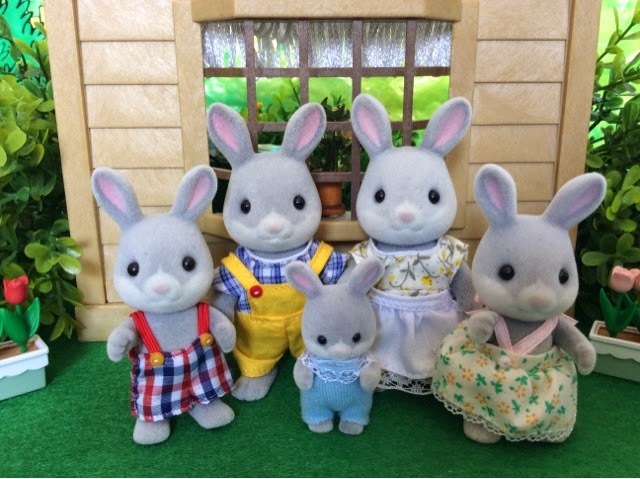 Their five children is just as friendly as their parents. The unusual thing about the children is that they are two sets of twins. 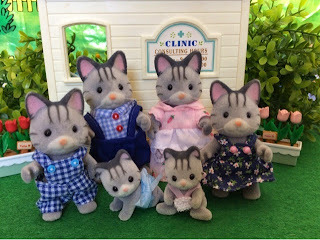 Little Emily is the newest addition to the family and according to mother Savannah, a dreamchild, but maybe that is because Emily is her first single baby. The eldest are, Ivor and Nellie who is 8 years old. When Savannah expected them, it was decided that they will not have more children. So it was with great surprise when they discovered that they will have another child. They were over the moon with excitement, which almost ended in hysterics when they heard that it will be twins again. Nana and Peanut will soon be turning two. Ivor desperately wants to be a hockey player when he grows up. He spends most of his time with his best friend Mark Maces “practicing”, which soon ends in a sword fight, with the hockey sticks being the swords. Sister Nellie loves ballet and often practices the role of the "Sugarbush Fairy". She loves wearing her beautiful pink tutu and satin ballet slippers. She also likes visiting her friends. They will play dress up and pretend to be rich and famous.The Trunk Twins Peanut and Nana are everyone’s favorite twins. They are so cute and always willing to crack a big smile when they see someone. Emily Trunk is very sweet and loving. She wants to be around her family, especially her brothers and sisters. She is constantly giving them hugs and kisses and she always wants to play with them. The Henry-Lloyd Family moved to Sugarbush Valley after Ben and Pippa decided they want a more relaxed lifestyle with less worries. They have settled in nicely, and have never for a minute regretted their decision to take the plunge. Father Ben and the rest of the Henry-Lloyds live in Ceder Terrace 1. He is an accomplished sailor and fishermen and will open a fishmonger in Sugarbush Valley soon. 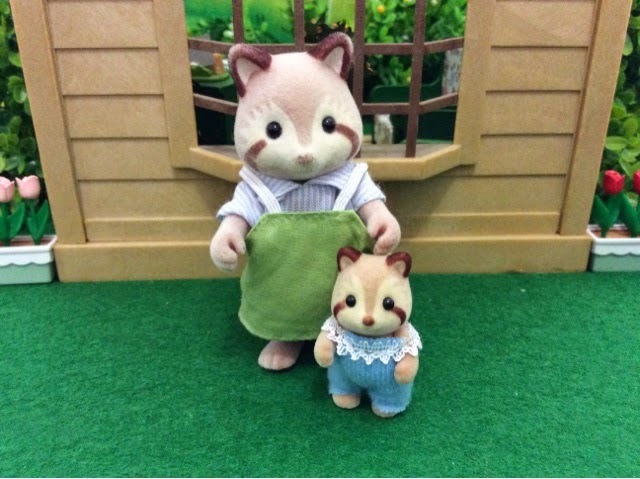 Mother Pippa is often described as the best mother in Sugarbush Valley. According to her friends her children has the best manners, and some even admitted that their own children behave like angels when Pippa is around. This might have something to do with the fact that Pippa owns a patisserie in the village square, and always offers free treats to the children. Zac loves sailing just like his dad, but also likes playing the saxophone. His music teacher thinks he is quite talented. Typical of a 10 year old he wants to be something different when he grows up, every week. A professional soccer player is the latest career choice. Sarah is just the cutest and sweetest little girl. Her favorite thing to do is to play dress up with her mother’s dresses, high heels en costume jewelry. She also loves visiting the dress shop to look at all the beautiful dresses. The twins Tom and Wendy are not really attention seeking and although they are quite friendly, they like nothing better then sleeping in a sunny spot in their room. Both Father Sebastiaan and Mother Katrina originates from Sugarbush Valley, they went to the same school all their life and even was in the same class, but as with children they didn't like each other very much then. Sebastiaan thought Katrina was too prim-and-proper, and Katrina found Sebastiaan to be too much of a "jock". With time they actually got to know one other and realised that they are perfect for each other. After they got married they toured the world, but always planned to return to their hometown. When Katrina found out she was expecting, they did return to Sugharbush Valley, and are living a happy and fulfilled life. Father Sebastiaan had his own landscaping business until recently, but as Katrina's florist grew and got more popular he sold the business to the Mcburrows family who just moved to Sugarbush Valley. Now that he is working for his wife he is even busier than before, doing pick ups from the market, delivering bouquets of flowers to customers and balancing the books of the business. Mother Katrina owns the Village Florist, which she inherited form her Mother May Blossom. Being the perfectionist that she is, she made some renovations when she took over the shop, but she decided to keep the name. They live in Meadowcroft Cottage together with their four children. Branson who is fourteen, Amelia who is thirteen and the twins Jeremy and Stephani. Branson is an excellent athlete and the best soccer player in the school. His main goal is to beat his best friend Oliver Periwinkle in tennis. Amelia is a fun loving girl and is very energetic. She loves to play any kind of game and her friends thinks she is rather exhausting. The twins are becoming a handful and Katrina's stern looks at them doesn't have the desired effect anymore. Katrina's brother, Michael Calico, lives in Mystique Valley. They visit him often and Amelia misses her cousin, Margot, very much. 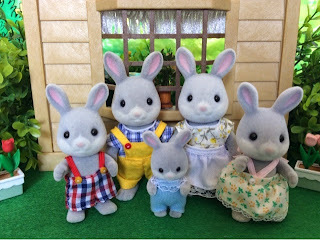 The Blackberry Family live in the Gypsy Caravan on a small plot of land, which was previously part of Highfields farm. Bob and Betty are what you call the Nomadic type, and like nothing more than travelling around the country in their caravan. However, with the birth of Eaton, two years ago they decided to settle down in Sugarbush Valley. 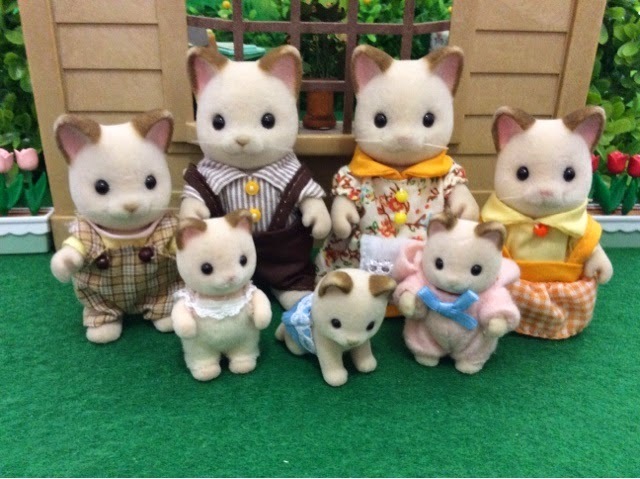 They were trying to find a house in the village to suit their personalities but never felt happy with anything. It was then that they decided to make their Gypsy Caravan their permanent home and started to look for a plot of land to park it on. Around the same time Hornbull Buttercup decided to sell a small part of his farm as he needed some money to build a new dairy. The deal was done and now the Blackberries are very content living on their permanent campsite. Naturally the Blackberries love the outdoors and that is also the reason why both Father Bob and Mother Betty has shops in the village square. Mother Betty owns and runs a small juice bar and Father Bob is responsible for providing the villagers with the freshest fruit and vegetables at his fresh produce market. Ingrid, who are 13, loves camping and insisted that she wanted to move out of the caravan and into her own tent for her thirteenth birthday. Therefore, Ingrid received a tent with all necessary camping gear for her birthday. 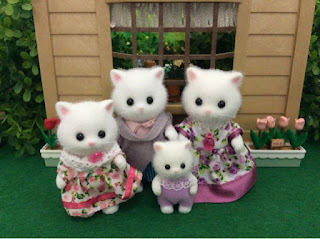 Her friends, Kirsty Corntop and Amelia Whiskers loves sleep overs at the Blackberry camp. Twin sister, Yvette, loves rowing. She spent 5 years at a top school in the country on a rowing scholarship. She would like to row around the world, but for now she is happy to be back in Sugarbush Valley with her family and just to row on the river and waterways here. Little Eaton is two, but has already shown that he prefers to be outside rather than inside. His teacher at the nursery school, Mrs. Chiffon, is having a hard time keeping him off the playground swing and jungle gym, when it is story time or time for music lessons inside. 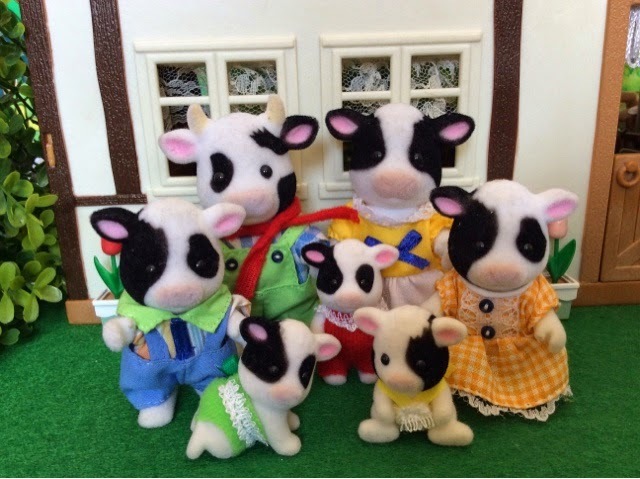 The Maces family recently moved to the Village. Father Spencer was the owner of a big department store in the Big City, but he was often tired, never had time for his family and his health was deteriorating fast. It was his brother, Cecil Maces who told him that he must seek a quieter life. Cecil had by the time moved to Marigold Creek, and was very happy in his new village. One day while taking a much needed break from work, Father Spencer took his family on an outing to visit his second cousin removed, Darcy Fielding in Sugarbush Valley. He and Arvey immediately fell in love with the quaint town and decided that this is the place to relocate too. After some research Spencer decided to open a scaled down version of his shop in the Big City. They were lucky to find the ideal space with a small apartment on top, that they converted into a cosy cottage, they refer to as Applewood Cottage. They have been living in the village for a while now and opened the Country Market some time ago. Business are looking good and Mother Arvey's small tearoom are also a big hit with the village women. 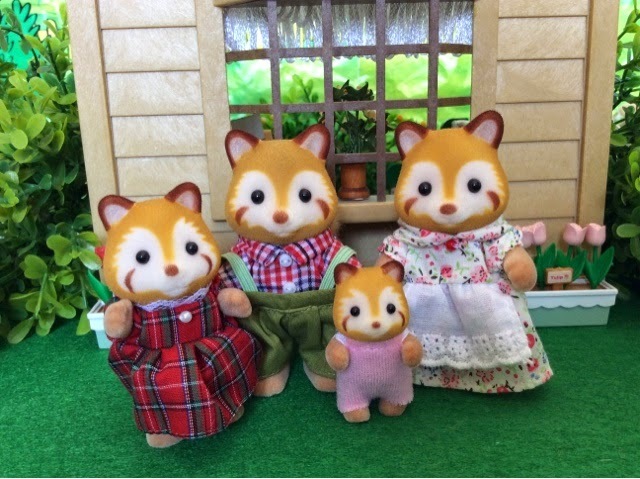 Their three children are also adjusting fine to the new lifestyle. Nichole has already become best friends with Rebecca Periwinkle and is the star of the netball team. Mark enjoys the new freedom he has, and together with his new best friend Ivor Trunk, has hours of fun. JC is very excited to finally start nursery school, as he just loves story time and Delia is the best storyteller. The Corntops are new to the Village of Sugarbush Valley. It is Christabel and Hector's dream to open a deli in the Village. They've already found the ideal vacant spot, also with a small apartment on top. As soon as the time is ready they will have a grand opening celebration for the deli and move into their new cottage. The Corntops are related to the Blackberries. Christabel and Betty's mothers are cousins. 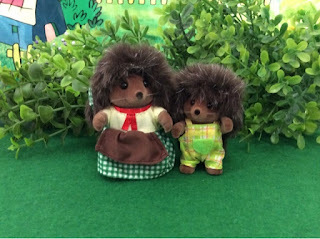 Being a shy girl, Kirsty was very worried of making new friends in the village, but Ingrid helped her to adjust quickly, and she found a best friend in Amelia Whiskers. 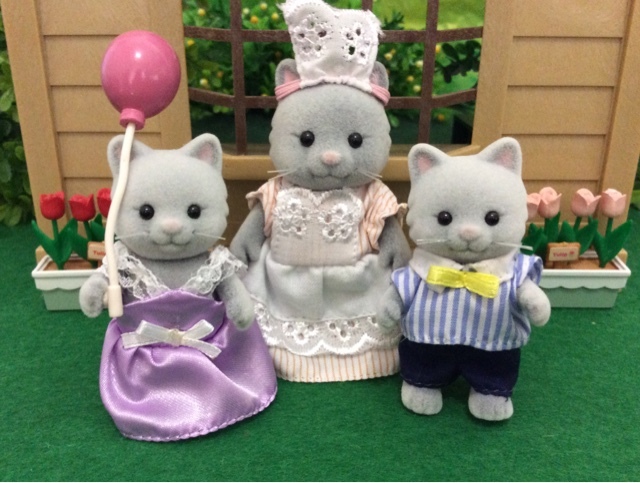 Kirsty also loves spending time in the Blackberry camp with her two cousins. She thinks Ingrid and Yvette is quite lucky to be permanently camping. Baby Cora is even shyer then her older sister, and prefers to spend time with her mother, but the birth of baby Troy helped her to became more self sufficient. She is after all a big girl of four now. Troy is the opposite of his two sister, and extremely extroverted. Whenever a new customer enters the deli, he would start babbling away with them as if in deep conversation. The Buttercup family has been the owners of Highfields farm, on the outskirts of Sugarbush Valley for centuries. Hornbull inherited the farm from his dad, and his dad from his father etc. Hornbull is a dairy farmer and a very proud one too. He supplies the village and the neighbouring towns with fresh milk daily. As Hornbull is quite the introvert he loves walking through the fields and woods on his farm all alone. He likes the peace and quiet and gets annoyed if he is disturbed during his thoughtful strolls. 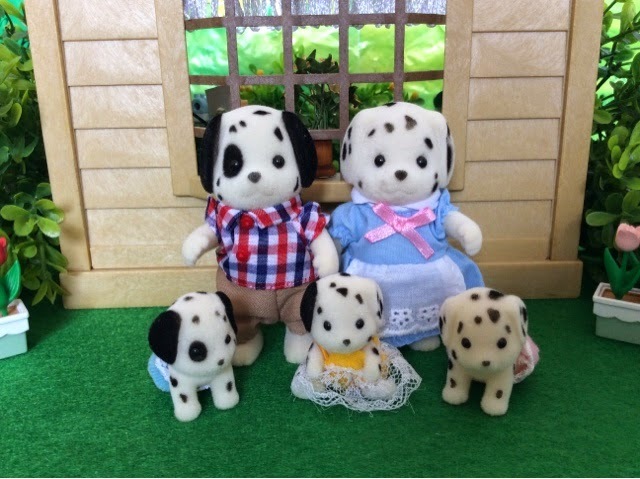 Mother Daisy is the exact opposite of her husband and can be very nosy and likes to see and know what is going on. If she sees anyone out for a walk or off shopping, she will wander over to see what they are up to and have a chat. She owns the ice cream cart in the village square where she sells home made ice cream made from the milk her husband supplies. She loves her job, as this gives her ample opportunity to know exactly what is going on in the lives of the other villagers. They have five children. Brother Paddock is always running, skipping and jumping everywhere, he just can't seem too stand still for long. When together with his three best friends Zac, David and Hector they can create quite a stir when running past.Sister Annabell does not like to rush anything. Unlike her brother she has never been seen to run or even jog, and appears very lady like. She's not too fond of farm life and prefers to stay inside. Baby Cheddar loves the game hide and seek. He is always missing as he tends to forget to tell people that he is playing the game. His favorite hiding place is the old barn on the farm. Dolly and Fennel are shy babies who don't like being away from their mother Daisy. They will not play by themselves when their mother is busy and she has to come up with ingenious ways to keep them occupied in order for her to continue working. Other than Daisy (and their father of course) the only person they will allow to get near them is Daisy's brother, Gabriel Hornigold. Unfortunately he lives in Marigold Creek, and they don't get too see him much. Grandfather Angus formed the Eaglewood Ramblers’ Club to encourage everyone to take up walking as a healthy and relaxing pursuit. Along with his wife, Bessie, he also ensures that all the local footpaths are kept in good repair and clear for everyone to use and enjoy. 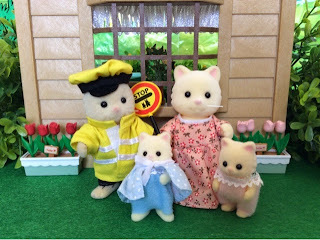 “Footpaths are part of our great Sylvanian heritage,” he is often heard to proclaim. Grandma Bessie also enjoys the great outdoors with its scenic beauty and healthy fresh air. As a proud member of the Eaglewood Ramblers’ Club, she is in charge of producing the club’s leaflets which informs members of the best scenic routes around the area! The Periwinkles own the shoe shop and lives in Cedar Terrace 2. Father Alex is a skilled cobbler. He likes nothing better than to sit in the back of his shop and make shoes. Mother Kate designs most of the shoes her husband makes, but also runs the front shop. She loves helping the clients decide on which pair of shoes to buy, and nothing gives her more satisfaction then seeing a customer leave with bags of shoes. 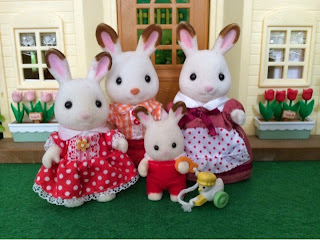 They have three children,Oliver, Rebecca and little baby Hannah. Oliver is an accomplished tennis player and it is his dream to be world number 1 some day and be the Wimbledon champion. Although tennis is his first love, he loves any sport and he is always competing with his best friend Branson for top spot. Although not as talented or as interested in sport as her brother, Rebecca likes playing netball. She, however, prefers to help her mother in the shoe shop and wants to be a fashion designer one day. Hannah loves sleeping more than anything else, even at meal times. Her mother always has to tickle her paws to make her wake up and finish her milk. 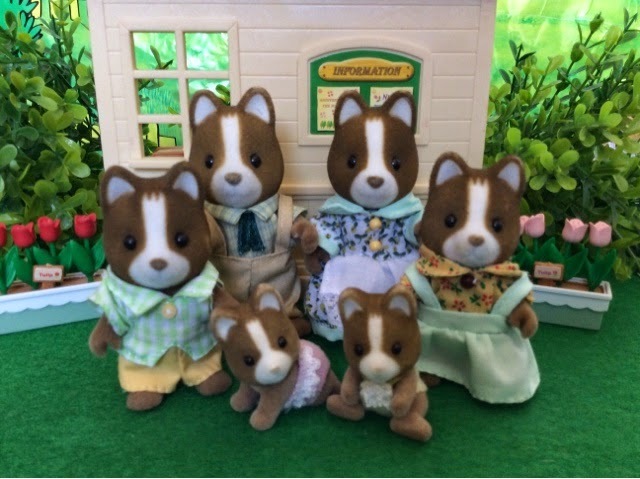 Grandparent Mack and Mable just decided to permanently relocate to Sugarbush Valley. Their daughter-in-law, Kate, is not ecstatic about this, but she has know choice as the old folks has nowhere else to go. 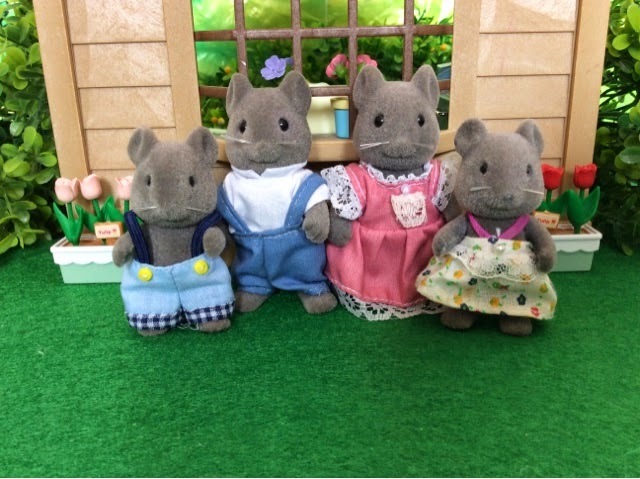 When he was younger, Mack Periwinkle was the Sylvanian Open Tennis Champion three years on the bounce. He had to give up playing when he got a tennis elbow. Now that he is older he coaches his grandson, Oliver, who he expects to be the next champion. 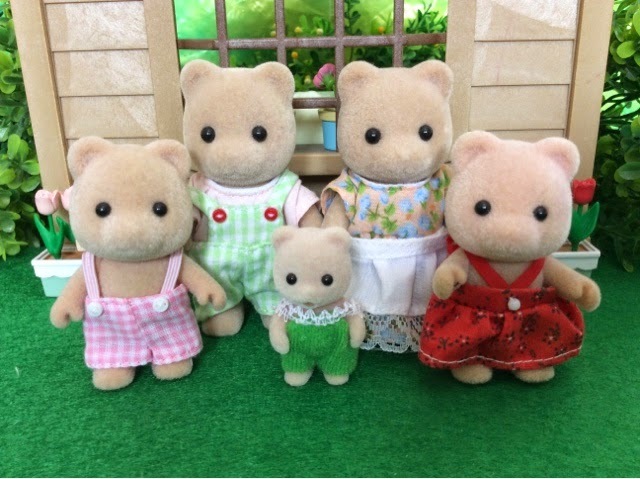 Mable is an expert at knitting and sewing, making all her own clothes, as well as those for her grand children. Rebecca loves her grandmother's creations, but Oliver not so much. The Chocolate family only recently arrived in Sugarbush Valley. They are from Italy and Frasier Chocolate is a proud Italian. His parents Rhys and Patricia has a small retirement cottage in Eaglewood, and on their recommendation he decided to relocate to Sugarbush Valley, afterall “La famiglia è la famiglia e sono importanti”. It is his plan to open an authentic Pizzeria, and show of all the skills his father taught him. Mother Teri was very keen on this move, she loves being back in her birth country, as she never quite adapted to the Italian ways. She is even more excited about the Pizzeria they will be opening. Teri has many ideas for exotic pizza combinations and is sure it will be a huge success with the open minded villagers of Sugarbush Valley. Their fourteen year old daughter, Freya was not so keen on the relocation. She loves Italy, the language, the food and most of all the history. She will have no friends in Sugarbush Valley and knows nothing about her mother’s birth country and she is surely not interested in finding out anything. It is however comforting that her grandparents will be there. Baby Crème, knows something big has happened, but she is not really sure what. She doesn't really care either as long as there are enough olives and cheese for her to eat, she can be anywhere. 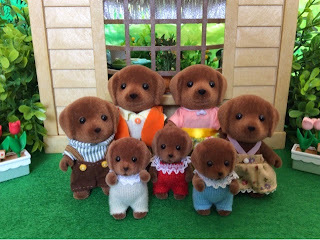 The Chocolate family has relatives in Marigold Creek, Mother Teri's sister, Flora and her family lives there. 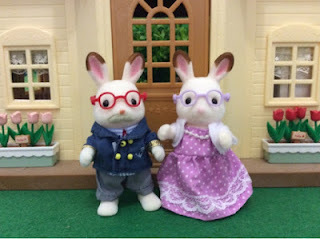 Peppermint is a fashion conscious rabbit and is always beautifully dressed and manicured! She lists among her favorite things, clothes shopping, having her nails done and catching up on her beauty sleep. Peppermint is the younger sister of Frasier Chocolate. Grandpa Caleb Breeze has been a sailor all his life. Now retired, he still loves the ocean, but sailing has become too exhausting for him. He still wears his smart sailor’s jacket with gold cuffs, which he loves dearly, so he still looks the part! Grandma Valerie Breeze loves the ocean too, but from the shore. She used to sit for hours, accompanied by her two daughters Flora and Teri, staring out over the ocean waiting for Caleb to return from his trips. 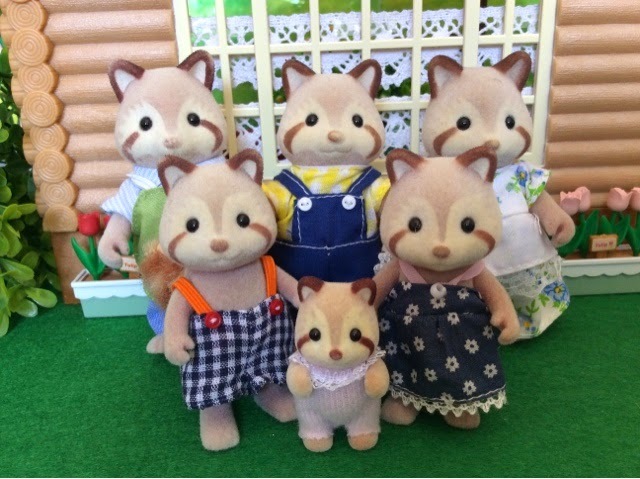 Valerie loves her grandchildren, and feel blessed for having Freya and Crème so close buy, but she miss her Löffel grandchildren, and wishes they could visit more often! 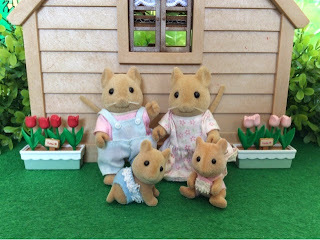 The Mulberry family lives in the log cabin on the edge of town. Father Elmar has lived in Sugarbush Valley all his life and is the village plumber. No job is too big or small for him. Elmar loves talking and at the end of a job usually knows everything about his client. Mother Mae runs the Sugarbush Laundromat and absolutely loves her job. She loves the smell of fresh, clean laundry and while ironing makes up the most beautiful stories, which she used to tell to Ike and Candy at bedtime. These days little Pumpkin is the fortunate one to hear the wonderful stories, and squeal with delight when she hears the stories. Mae can't wait for her sister, who lives in Mystique Valley, to meet her little daughter. The Mulberries have three children. Brother Ike is sixteen and loves walking. It is his dream to become a game ranger or nature conservationist one day. The problem is that he has absolutely no sense of direction, which is weird for a sixteen year old! So whenever he goes on one of his walks he inevitably gets lost - which worries his poor Mom and Dad. Sister Candy is a gentle, soft-spoken 14 year old who loves writing. Her greatest success to date is an essay she had published in the district newspaper about "Happy Days in the Park!" After school she will study to be a journalist, but secretly wants to be a children’s book writer like Mrs Trunk, who she idealises. Cookie Mulberry cannot sit still. She loves to crawl from one corner to the next and back. It is almost as if she is trying to beat her previous time. Mother Mae has realised the only time that Pumpkin does sit still is when she tells her one of her wonderful stories. Uncle Edward Mulberry is a relatively new resident of Sugarbush Valley, but not really a new face. He has often in the past visited his brother, Elmar, and his family and is quite familiar with the village and its people. Till recently Edward lived in Oxbridgeshire with his daughter Martha Mulberry. Martha’s mother and Edward’s wife died when Martha was a little girl. Martha however decided to go to a very distinguished boarding school from which she accepted a scholarship. As his parents, George and Mildred, also resides in Oxbridgeshire he could leave Martha with a peaceful mind as he knew she is in safe hands with his parents near. He now is a permanent resident of Sugarbush Valley and the village is just what he needs, peaceful and quiet. Edward mends and restores vintage and rare toys. He spends hours at his workbench to ensure that the broken toys are as good as new. Lots of useful tools, paints and books about toys can be found in his small work room. Since Edward moved to the village many of the parcels that Postman Pete Petite receives daily is from adult collectors all over the globe, who believes that Edward will be able to save their beloved toys. Martha loves nothing better than the great outdoors and enjoys camping and hiking. She joined the brownies of Oxbridgeshire when she was very young and is still a keen girl guide. Since moving to Sugarbush Valley to permanently live with her father and baby brother, a tent is her room.Edward Charles Mulberry, or better known as Pumpkin is a happy-go-lucky little boy, who will smile at anyone as long as you keep him supplied with lots of sweets! Despite his recent circumstances, his father Edward Mulberry is relieved to notice that he is adjusting well. They lives in a small treehouse, next to his brothers log cabin on the outskirts of town. Pete is a jolly fellow, who can be seen riding his bicycle through the streets of Sugarbush Valley early each morning to deliver and pick up the villager's mail. After his rounds he opens the Post Office to sort all the mail and assist his customers. Pete loves his job, especially the look on someone's face when he delivers an unexpected parcel or a birthday card. He often wonders if his cousin, Pete Petite, who lives in Mystique Valley enjoys his job so much too. Pete is married to the beautiful Margaret. They are now residing in Sugarbush Valley, and although Pete has all intentions to a house for his young family, they will have to be satisfied with the spare room in the Trunk family's home. Margaret grew up in Sweetwood Village. One day, on a return trip home from visiting friends in Mystique Valley she met Pete, it was love at first site, and when he asked her to move with him to Sugarbush Valley, she didn't even considered saying no. As a qualified beautician Margaret has thought of opening a small beauty salon in Sugarbush Valley. The woman of the village is really looking forward to this, but for now Margaret is attending to them in privacy of their own homes, but for now Margaret is pouring all her energy into little Halley and her needs. Halley is a sweet girl who laughs alot and gives her parents endless pleasure. 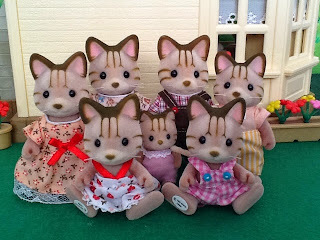 The Chiffon family of 6 lives in Cedar Terrace 6. Father Gordon is the teacher of the junior class at St John’s school. He loves the energy that each learner brings to his class and tries not to inhabit their personalities with strict rules. Due to the fact that he is of Scottish decent he is an accomplished Bagpipe player and would love to give lessons to a young protégé, but up until now none of his learners seemed interested. Mother Delia is the teacher at the Nursery school. Like her husband she loves to teach children, but unlike him she is quite strict. Both Gordon and Delia have been teachers for a while but only opened their respective schools in Sugarbush Valley recently. They have four children Brother David who is 10 and Sister Karen who is 9, and the twins Austin and Nigella. David and Karen has to share a bedroom but it is an absolute nightmare for their parents as they are constantly fighting. 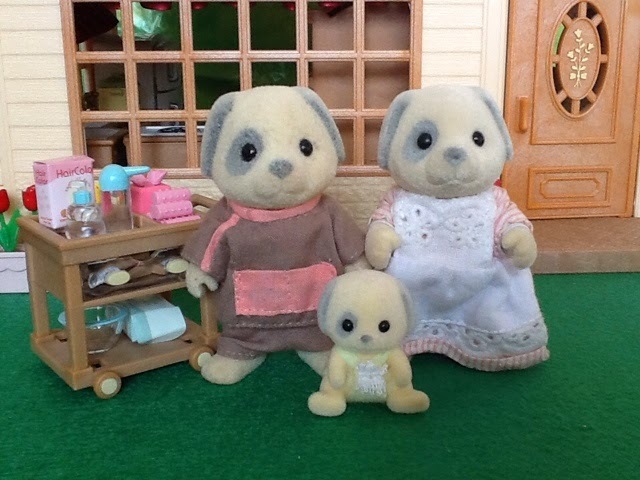 Delia has talked to her friends Pippa and Daisy, but they don’t seem to have this problem with their children. David loves nothing more than spending weekends at his friend’s, Paddock Buttercup, house, just to get away from his sister. Karen is oblivious to her brother’s feelings towards her and will ask him a 1000 questions each time she sees him, isn’t that what older brother are for. Austin and Nigella are two very entertaining babies. Nigella loves making alot of noise. Austin is a happy-go-lucky little boy, who will smile at anyone as long as they keep him supplied with lots of sweets! Antonio Patches enjoys being a father and a good husband after being away from his family for so long. Business is good and he is saving up to buy his darling wife her own cottage, as they can’t live with the Henry-Lloyds forever. Both Antonio ad Dorothy are qualified hairdressers, and plans to open a salon soon. They want their salon to be a place where villagers can relax and unwind, whilst being pampered. They can have their hair washed in a relaxing, reclining chair and then styled whilst reading about the latest beauty tips in the magazines! Dorothy has build up a good client base for her and her husband, and her clients are more than happy with her handy work. She hopes their dream of opening a hairdresser salon will be realised soon. Kyle is a sweet little boy who only cries when he is hungry. The Fielding Family owns the hamburger restaurant, The Hamburger Shack, and lives in an apartment on top of the restaurant. Mother Bridget fondly named it Sycamore cottage. They have been residents of Sugarbush Valley for many years. It is a bit odd that such a shy and introverted family owns a restaurant, but they’re doing a fine job of it. Father Darcy is the chef in the restaurant and is famous for his delicious burgers. Everyone has tried to get his 'secret sauce' recipe out of him, but with no success as he is just to shy to speak to anyone. Mother Bridget is the manager at the restaurant, and ideal for the job. Although shy by nature too, she gets a certain confidence and charm when opening the restaurant in the morning. They have three children, brother Daniel who is as intelligent as can be. But it took his teachers a long time to discover this as he never says more than two words in class. It was only when he got top marks in every subject that they realised just how clever he was. Sister Helen is as quiet as the rest of her family, except when she is in her Father’s restaurant. When she sets foot in the restaurant she begins to order everyone around as loudly as possible. Baby Clop is the opposite of the rest of the family. He is very loud and can make quite a noise when unhappy about something. His favorite word is mine, and don’t try to tell him otherwise. The Fishers are relatively new to Sugarbush Valley, but like all other newcomers to the village, has found their feet quickly with the help of the friendly villagers. Father Schroeder was a bit skeptical about the move, especially if he will be able to provide for his family and make a living, not to mention a good living, like what they were use to in The Big City. Both he and Isabel decided to take the risk, mainly as a favor to there friend Hugo Trunk, who practically begged Schroeder to apply for the job as doctor in Sugarbush Valley. Father Schroeder is the doctor of Sugarbush Valley. Schroeder is the quiet sort and give his patients time to talk about their woes and illnesses until asked for advice, and then he can talk forever, which often gets him into trouble with his diligent receptionist who likes to keep to the schedule and the day’s appointments. Mother Isabel is the receptionist at her husband’s medical practice and therefore the “boss”. She is extremely organized and is already famous for how she can draw out time and make it more. She will always manage to fit a patient into an already busy schedule. She is just too caring to show someone away. Aside from running Schroeder’s practice, Isabel's favorite past time is gardening. She longs to have her own garden, but for now she pours all her energy into the garden of the Commune, which is fast becoming the most luscious in all of Sugarbush Valley. Brother Linus is known in Sugarbush Valley for his playful disposition and his many friends. He is a practical joker and loves to tease his sister and her friends. His best friend is Rumpus Macavity and their favorite past time is performing practical jokes in Sugarbush Valley. They have been in a lot of trouble because of this. Sister Lauren loves to run through the village streets, climb trees and jump rope with her friends. She is always returning home with various cuts and bruises. All it takes, however, is a quick bath, a little lecture from her Mother and she is out and about the next morning to do it all over again. Asparagus Macavity is her best friend, and although totally unaware of this, they are two of the most popular girls in Sugarbush Valley. Eddie likes to make a lot of noise! He loves to bang anything in reach with his cymbals or drum stick. Michelle loves to play quietly on the grass and can spend hours entertaining herself with flowers, birds and butterflies. Sidney Hazelnut and his family just moved to Sugarbush Valley and Mayor Hugo Trunk couldn't be happier. Sidney is the first member of Hugo’s handpicked town council. As the Town Planer he is much needed, as many villagers is homeless or needs buildings for their shops. Sidney and Hugo has already draughted a detailed plan to have all villagers housed very soon. Mother Mona is a hardworker who compliments her husband's work perfectly by handling everything that happens behind the scenes. She pays great attention to detail and seems to be doing 101 things at once. Otto loves his bed. Although not lazy he is just not a morning person. His mother has to call him at least three times every morning to get up for school. However, Saturday mornings is different. This is the day Otto plays football and he gets himself up, dressed and grabs a quick breakfast before setting off to play with his best friend Diggory Honeybear, without one prompt from his mother. Odette is a very quiet, soft spoken, shy young lady. She is so shy and quiet that some might think she has fallen asleep. She is however, extremely intelligent, and always surprises everyone when she answers a question in class out of turn. Baby Joe loves night time. He will sleep the whole day and when the rest of his family is ready for bed, he wants to play. 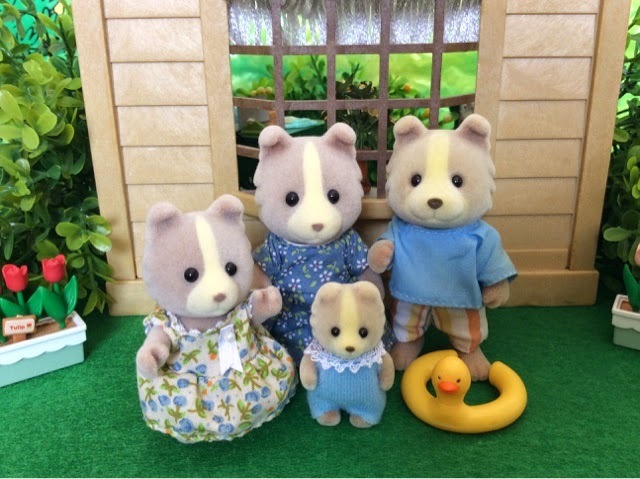 Father Hubert Alan and his wife Hatty has lived with their children in the village for quite some time now, sharing a house with their friends the Slydale Family. As a senior class teacher Father Hubert Alan had to work in Blueberry Hill until recently, as there was no senior class to teach in Sugarbush Valley. Lucky for Father Hubert Alan that changed and now he can devote his free time (which he always spend traveling from home to work) to concentrate on his hobby, which is being a 'wordsmith' and finding out the meaning of names and new words. Mother Hatty is a very clever and practical lady who knows what she wants. Hatty is the district's school inspector, which includes Sugarbush Valley, Blueberry Hill and Eaglewood. As a school inspector she is her own boss and plans her time to be at home in the afternoon to be with her family. Hatty means 'house ruler', but Mayor Trunk sometimes wonder if it is not ‘village ruler”. Despite her nosiness, Hatty is loved by all and often approached for help with regards to certain issues. Brother Dennis is strong minded about what he will and will not do. This relates to all decisions made. He will only eat certain food, do the homework of certain subjects and play certain sports. Even his best friend Buster Slydale has tried to convince him otherwise, but to no avail. Due to his stubbornness Dennis is constantly in trouble especially with his teacher, who is ironically also his father. Sister Esme’s name means 'beloved' a suitable name for daddy’s little sweetheart. She loves everything about life. She doesn’t have a worst subject in school as she loves them all. She also loves her brother very much, even when he is being so stubborn. And she just loveeeees spending time with her best friend Scarlet. Jethro and his twin sister Cordelia are inseparable! They are always giggling and smiling as they play with all their toys. Jethro especially loves playing with his toy trains, while Cordelia loves to "read" picture books. Father Digger is a soil and garden expert. He owns his own garden landscaping business in Sugarbush Valley and the work is pouring in. Being relatively new to the village he and his family are still finding their feet. Mother Heidi is quite excited to finally be part of a larger community as the place they have moved from was very remote. She is very house-proud and loves decorating her house with beautiful things. No matter when you visit you will always find her cleaning and decorating. She wisher her brother, Graber, who lives in Mystique Valley and sister, Molly, from Marigold Creek could visit them. 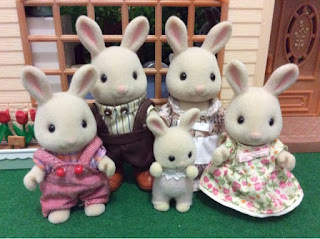 Digger and Heidi have three children Muddy and Molly who are twins, and newborn baby Monty. The twins are inseparable and is best friends. 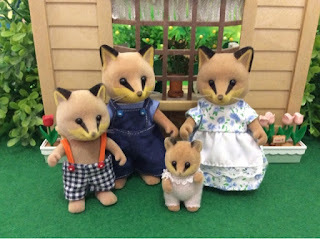 Heidi has tried numerously to get them to make friends with other children, but to no avail. She is hoping that things will change in their new hometown. Brother Muddy drives his mother up the wall. He just cannot keep his clothes clean and is always covered in mud, which makes her job of cleaning the house never ending. Sister Molly is very clever with her hands. She loves to make presents for all her family and friends. She can turn a simple toiletroll holder into anything from a butterfly to a racing car. Monty is a wriggler and never sits or lay still. When on the floor he will find a way to move around, be it crawling, shuffling or rolling. When he is on his mother’s lap he prefers to constantly jump up and down. 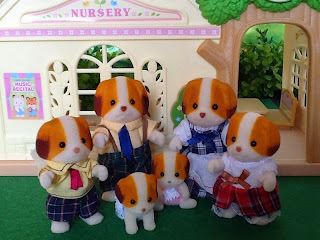 Although both Bertie and Tamsie grew up in Sugarbush Valley, they only recently opened their own business, the Bakery. It quickly became evident that they made the right decision as the bakery quickly became very busy. Father Bertie did his apprenticeship as a miller in the nearby village of Eaglewood, who has the oldest Mill in the region, but when his wife, Tamsie, suggested they should save up and open their own bakery, Bertie was on-board immediately. 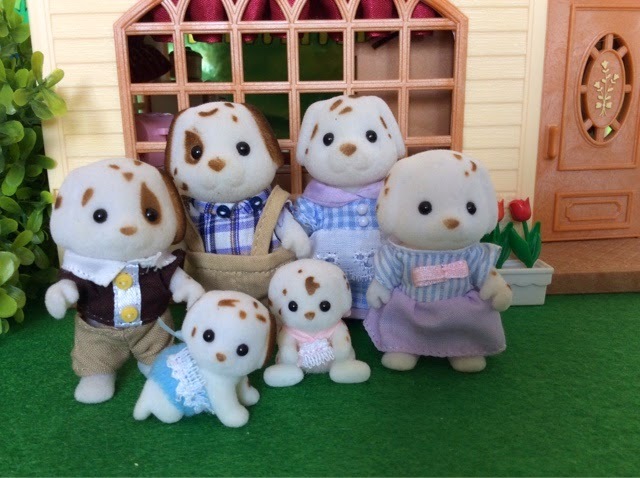 Mother Tamsie, being an orphan, had to get a job right after she graduated from High School and old mister Beagle and his wife Prunella, who owned the village bakery at that stage, took her in and gave her a chance. She learned the art of baking from them and even though she was able to bake the most amazing loaves of bread, her true love was baking little dainties and sweet cakes, topped with lots of tasty fruits and berries. The day that old mister Beagle died and Aunt Prunella decided to close the bakery was a sad and dark day for Tamsie. Luckily, because of her skill she soon got a well paying job at the most exclusive hotel in The Big City and she managed to save up. 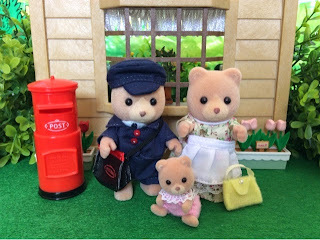 It was difficult times as Tamsie’s whole salary were being saved and they had to scrape by on Bertie’s salary. Now they are picking the fruit of those few difficult years and couldn't be happier. They have three children, Brother Diggory, Sister Katy, and baby girl Lumy. Diggory is a very quiet boy who keeps to himself. As the eldest he feels compelled to help his parents in the bakery, but as he is too shy to take orders he usually gets to deliver the freshly baked breads. He just loves this alone time, and on weekends and in the afternoons after school can often be seen cycling around the village. Sister Katy is still too small to work in the bakery, but is allowed to help her mother pick fresh fruits and berries. Katy also loves to visit her friend Nellie Trunk at Beechwood Hall and play dress-up. Baby Lumy is very curious. She is always exploring or asking questions about anything and everything. Her favorite questions are "What are you doing? ", "What is that? ", or "How does that work?" Bertie has a brother, Horace, who is a bee and honey farmer in Mystique Valley. Slick Slydale grew up in Sugarbush Valley and has lived in the small village all his life. He has seen it grow and like his friend Hugo Trunk, he envisions much growth and expansion for the village, even though he is aware that it might upset Nelson Puddleford and Hornbull Buttercup, but he has ways to deal with them. It is obvious that Slick is the cleverest man in Sugarbush Valley and he has an answer to every question or problem. Other than being the Village treasurer he also has a small accountancy practice in the village, which makes him the brains behind most of the businesses in town. To get through all his work he gets up at six o'clock every morning. There always seems to be yet another job to do! Mother Velvette is a well groomed lady with perfect manners. She is on every social committee in town and is always busy going from one meeting to another. She is also often asked to be the judge of various competitions and contents. Even though she is always busy, Velvette adores her three children and ensures to have a special moment with each of them everyday. She just loves to tell wonderful stories to Buster, play dress-up with Scarlett and tickle little Lindy until she screams for mercy! Brother Buster is a real handful and almost just as clever as his dad, he is always making some sort of plan with his best friend Dennis Huckleberry. Although he doesn't know what he wants to be when he grows up, he certainly isn't going to be an accountant, not only is arithmetic his least favorite subject, but he can’t see how he will ever need it when he grows up. Sister Scarlett’s favorite pastime is arguing with her brother. She argues over everything with him, their toys, chores, and nearly everything else. She wants to be a lawyer one day and by arguing with her brother she pretends to be arguing a big case in front of a judge. When her brother is not around she spends time with her best friend Esmé Huckleberry (not arguing). Baby Lindy is an amazing little lady who takes after her mother a lot. She already has perfect manners, saying please and thank you every time. She also never squeals or cries to get attention or to get her way. She just sits and waits patiently till her mother attends to her. The Renards are a very popular family in Sugarbush Valley, maybe because they play such and important role in the daily lives of their fellow villagers. Father Eric is an 'odd job' man. He mends broken windows, repairs roofs, re-hangs gates that don't close properly, you name it, he does it! Father Eric adores, his children, Baden and Carrie. In his spare time he likes to teach Baden the tricks of his trade, which Baden finds very interesting. The two also love to jog, and can often be seen jogging along the country road early in the morning. When playing with Carrie he is much gentler, and would always carry her on his should if they are walking somewhere. Mother Roxy owns and runs a cleaning services business. The village woman adore her, but not only because she cleans their untidy and messy homes, but because she is also the unofficial psychologist of the village and while cleaning, gives the most helpful advise to all her clients. Roxy is aware of the fact that many of the village women doesn’t need her to clean their houses, but just need a trustworthy person to listen to their woes. So she indulges them by listening, and giving them her opinion. But as she is very proud she will always continue her business of cleaning as she listens, and she has an unspoken rule never to discuss what she hears with anyone else, not even with Eric. 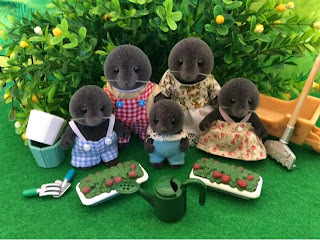 Baden is just as popular as his parents and though his best friend is Radish Dappledawn, he loves to play tennis with Oliver Periwinkle, shoot goals with Branson Whiskers, go on long walks with Ike Mulberry and be mischievous with Dennis and Buster. Little Carrie is a delight to her parents and a real ray of sunshine. She is always giggling, playing and just a generally happy little girl. What makes her even more remarkable is that her ears seem to work fantastically, which is a tremendous accomplishment for a 4-year old. 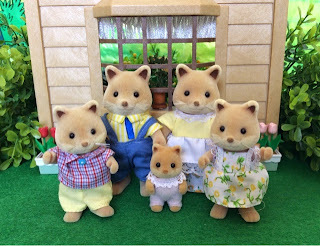 Charles Hunter-Smyth and his family just moved to Sugarbush Valley from The Big City and will live in the Sugarbush Valley Commune until their home is built. He and wife Camilla ran a very successful business in The Big City, designing and making clothes for a handful of exclusive clients. But as the clients got more and more demanding and they had less and less time for family life and their kids, they decided to move to Sugarbush Valley. They are quite content with their decision and it seems as if their 5 children is enjoying themselves as well. Father Charles is a tailor by trade. He has been making clothes all his life and learned all his skills from his mother. He loves sitting in front of his sewing machine and see how and outfit comes together. Charles is incredibly fussy, neat and so tidy that he sometimes drives Camilla, who is the designer of the clothes, mad. He will not sell a dress, a shirt or even a handkerchief to a customer if it is not perfectly sewn. Mother Camilla designs all the outfits made and sold in their new dress shop. Although designing is and will always be here first love she realised that she is a successful saleslady too and that the women of the village trust her opinion. She can convince anyone to buy anything, but will only do so if they look good in an outfit and needs a push in the right direction. Charles and Camilla have five delightful children, brother Hector, sister Isabella and the triplets Dylan, Thomas and Gerard, who is fondly referred to as the terrible three by their siblings. Brother Hector likes to run around and play with the boys. He is always quick to learn a new game and is set on winning every time, as he hates losing. If he loses though, he always congratulates the winner and pretends as if it is not such a big deal. 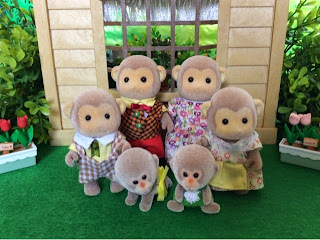 The Dappledawn family are new in town, but they have adapted so quickly that it seems as if they have just always been here. Herbage and Mayor Hugo Trunk is old varsity buddies and when it became evident that Sugarbush Valley needed a tourism expert, Herbage got the job. Being one with nature and packing up their caravan to go camping is what the Dappledawns love. If possible they try to do this twice a month, because according to Father Herbage “there are so many lovely places to see”. Due to this they have decided to make their caravan their permanent residence and just like that the ‘Sugarbush Valley Caravan Park’ originated. Father Herbage is the tour guide of Sugarbush Valley. He takes visitors to all the points of interest around the village and regales them with information about buildings and their origins, historical events and old customs. He loves to go for long walks in what he calls "The Great Outdoors". On these walks he explores new sites to include in his next outings with tourists. Herbage also serves on Mayor Hugo’s town council as the Tourism Information Officer and has to come up with new ideas regularly to lure tourists to the Valley. 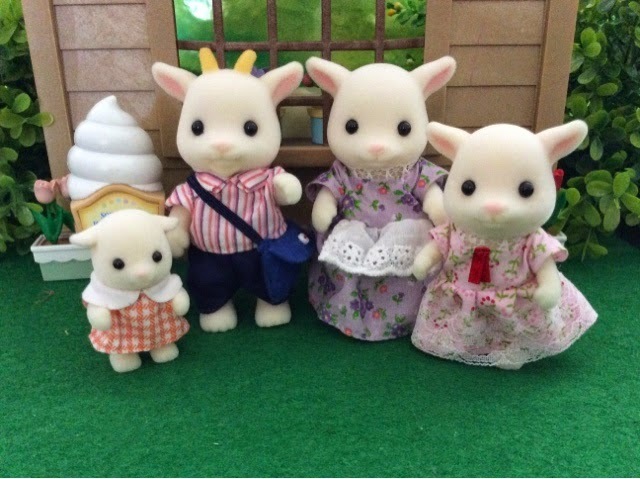 Herbage is a great father and when time permits he loves to play with his children, and take them on excursions. On Friday afternoons when the children return from school their caravan is usually packed and ready to go for a weekend filled with adventure and fun. During school holidays they usually make the trip to Corntopville to visit his mother Hazel Dappledawn, while there they ensure to make time to spend some time with Theodora's sister, Emily Nightingale, who is a nurse in the village. Mother Theodora runs the well organised Tourist Information Office. The walls of Theodora’s office are full of posters and maps and she has leaflets full of details about everything that is happening in Sylvania. Theodora also has a passion for anything old. Her favourite pastime is visiting stately homes and historic monuments. She says that they "bring history to life". The children have a great time because whenever the family visits such places, she makes up brilliant stories about the people who lived there. But her stories always have a happy ending so that her children don't have nightmares. Brother Radish is full of energy, rushing hither and thither like a mad thing. On family excursions he loves running around castles pretending he is a gallant knight rescuing fair maidens and challenging evil barons to duels. He also enjoys orienteering with his friend, Baden Renard where they have to get from one place to another as quickly as possible with the help of a map and a compass. Unlike her brother, Sister Tilly is a very quiet girl who never runs or rushes around. She will happily spend hours and hours in nature bird watching, but during winter she would spend all day, every day reading a book in a quiet nook in the caravan. Dillon Dappledawn never stops smiling! He's happiest sitting on his father's broad shoulders because from up there he can watch the pretty countryside go by and that makes him smile even more. Cotton Dappledawn is always crying or whimpering about something or other, so her poor mother is praying she will grow out of this awkward phase! 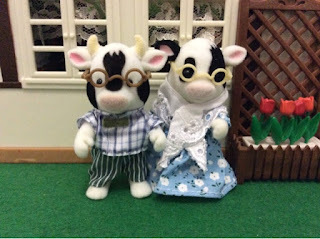 Stilton and his wife Rosemary are the proprietors of the Harvester Restaurant in Sugarbush Valley, the oldest culinary establishment in the district. Stilton took over the reigns from his mother when she retired. Stilton lost his dad at a very young age, which meant that he and his mother are very close as it has always only been the two of them. He has no siblings either. Stilton is the host and manager of the restaurant, during the day he balances the book and in the evening he plays the charming host. He can however; also cook up a storm and his vegetables lasagna is a sure winner. Rosemary is the cook in the restaurant. She has no formal training but is without a doubt the best cook in the Valley. She even wrote and published a recipe book. She started at the Harvester Restaurant as a waitress, mainly to earn some pocket money. Old Mrs. Bouquet however, quickly realised that Rosemary had a natural “feel” for cooking and slowly taught her some recipes and tricks of the trade. It was only much later that she fell in love with Stilton and after a few years of courting, Stilton popped the big question. Sage may be perceived by some as a quiet boy but his sparkly eyes and his cheeky smile give away his big personality. He is always ready to lend a helping hand to his friends and especially his fellow villagers. Sage idolises his father and wants to take over the family business one day and be just as good a manager and host as his father, therefore he already works in the family business cleaning and tidying, but only at weekends and after he has finished all his homework. Unlike her mother Jasmine has no inkling to cooking and usually burns, spills or ruins something. Her mother has tried and tried to show her how to cook, starting off with toasting bread and brewing coffee, but even that have had a disastrous outcome. She would much rather go for a long walk in the forest and pick wildflowers for the restaurant, she prefers setting the table to cooking and loves to add something to the tables to liven them up or make it romantic. Baby Lavender is three years old and probably the most mischievous of all the babies in Sugarbush Valley. She always has a twinkle in her eye, which is a dead give away for her plans. She mostly gets away with everything because of her infectious giggle when caught out. Maurice Chantilly and his small family have been living in Sugarbush Valley for quite some time now and they love the tranquility of the village. Maurice is the Lollipop Man of the schools in Sugarbush Valley, and he takes his job very seriously. As there is three schools in Sugarbush valley (nursery, junior school and senior school) he needs to be very organised to attend each school at exactly the right time in the morning and in the afternoon. He plans on starting a catering and party business with his sister Suzette Simpkins to keep him occupied during his “off” times. Myriam, or Mims as she is known to all her friends, is a qualified nurse and is the school nurse of Sugarbush Valley. She loves tending to broken bones and nasty colds. The children or rather her patients adore her as much as she does them, albeit for a different reason, as her pockets are always full of lollipops to give to her injured or sick patients. Myriam is also a new mother. Their new baby boy Jacques was born recently, it looks as if he might take after his bigger sister as he smiles all the time. They already have one baby daughter, Jocelyn. She is the apple of her dad’s eye and a giggler. She giggles at the slightest thing. Jacques is a quiet baby, much unlike his sister, but that quickly changes when he is awoken from his naps, by his sister's giggles. The Thistlethorn family is the official founders of Sugarbush Valley. Chester’s great grandfather (one of triplets) together with his brothers began the village which in those days, only had a church, general store and a post office. Chester’s great grandfather owned the general store and over the years it was converted into a Haberdashery, which is now owned by Chester and his wife Willow. Chester is the manager of the shop and responsible for placing all orders and balancing the accounts. He loves to sit in his cramped office surrounded by all his documents, but his favorite time of the day is the hour before opening the shop when he and Willow discuss all orders and what fabric, lace and ribbons he must order. Willow handles all sales. She loves giving her clients advice on which lace will suit which fabric and how to sew a pretty bow out of a piece of ribbon. Willow is of course an expert needlewoman and has made a few outfits for some special clients, but she enjoys embroidery more, as she finds it more relaxing. They lived in Meadowcroft Cottage 3, but unfortunately it was destroyed in a fire recently. They now are permanent residents for the Sugarbush Valley Commune. They have two children Lester and Prissy. Lester is a constant nibbler and eating is his favorite past time. He loves spending time at the Harvester Restaurant with his best friend Sage Bouquet, as there is always something to taste. Luckily he is also an avid soccer player. Prissy has got absolutely flawless manners, and is therefore the ideal sales woman, unfortunately Prissy shows no interest in her parent’s shop and wants to be a performer and soloist one day. At least she has a beautiful voice and has already melted many hearts. Jack and Maisie came to live in Sugarbush Valley totally by chance. The family went through a terrible ordeal, when Noah and Jess went missing during their annual family vacation on the banks of The Big River, near Sugarbush Valley. The twins were reunited with their parents a few weeks later, when they were found with the help of Dr Schroeder Fisher, at the Hawtons. The tranquility of the village and the warmth and hospitality of the villagers impressed the Meadows so much that they immediately decided to move to the village. 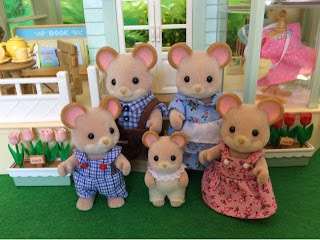 They were not very happy in The Big City and always struggled to make ends meet. Jack was offered a job by Hornbull Buttercup who was in desperate need of extra help on the farm; Jack accepted the offer without thinking twice. Maisie will for now attend to the twins but there was talk of helping Roxy Renard in her cleaning business.The Meadows just moved into an old stable on Highfields farm that was refurbished by Hornbull and Jack, and they couldn’t be happier. Andy and his wife Bethanie have been successfully farming vegetables in the valley for the past 10 years. Andy’s uncle, Roger Waters, bestowed a small plot of land on the edge of the village onto him and Bethanie as a wedding gift. At first they were unsure what to do with it. The first thought was to sell it, as they were settled in The Big City and had all intentions of staying there, but they felt awful for wanting to sell such an elaborate gift. They decided to keep it as a vacation spot; but after visiting Sugarbush Valley for the first time, it became clear that what they thought was happiness was nowhere near what they felt during the short time spent in the Village. Within the space of one month, they sold most of their earthly belongings and moved to Sugarbush Valley. Ever since this hasty decision, they have many times laughed at their madness for ever thinking of selling their plot. The Woodbrooks are now the biggest suppliers of vegetables to Sugarbush Valley and the surrounding villages. For his Fresh Produce Market, Bob Blackberry refuses to buy from any other suppliers than the Woodbrooks. Bethanie and Andy are the proud parents of two children, Abigail and Marcus. Abigail loves to paint pictures of the beautiful village and its surroundings. She can often be seen sitting alone somewhere with a brush or pencil in hand. Her best friend is Frances Redwood, and the two are inseparable. Baby boy Marcus loves to play among the vegetables crops, because of all the different kinds of bugs it attracts. He particularly likes the big praying mantises, but to the dismay of his sister loves any kind of creepy crawly insect. Bethanie has one brother, Mikhail Castor, who resides in Mystique Valley. Father Wilbur runs the Village Store that was opened by his grandfather many moons ago. Wilbur thoroughly enjoys his work, meeting and greeting his customers in the friendliest manner and always giving a helping hand when needed. But the most favorite part of his job is keeping the store clean and tidy with all the shelves well stocked. The hardest part for him is to keep the fruit and vegetables beautifully displayed in racks and baskets. Every morning he goes through the produce to remove any product that went off. Mother Fliss is mainly responsible for the accounts of the store and to ensure timely deliveries of items and fresh produce. Like her husband she likes everything in their store neat and tidy but sometimes, especially before opening time on a Saturday morning, she surreptitiously turn some of the food cans on the shelves upside down just to see her darling husband get into a bit of a fluster, to have everything need and tidy before the Saturday morning rush. Sister Frances is not very keen on working in the family business; she finds the whole process of shopkeeping rather annoying. As she is a very serious little girl, bit of an old soul, being friendly to customers is very tiresome to her, not to mention keeping items in neat rows on shelves. 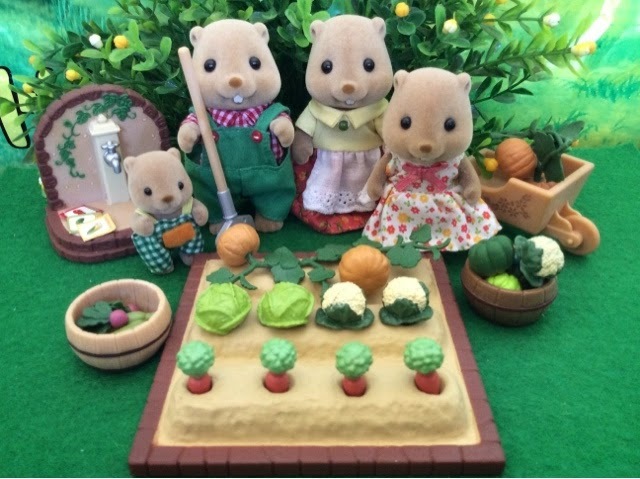 She much rather prefers to spend her days with her best friend Abigail on the Woodbrook’s plot of land picking vegetables. She constantly nags her father to rather close the store and buy a farm so that they can be farmers too. If her father inquires what type of farmer he should be she would always suggest wine farming. Baby Cali likes to help her Mother and Father in the store. It is however debatable if she is really helpful, as her favorite pastime is to repack the tins on the shelfs according to colour. Luckily she is very short, so most of the time it is only the bottom shelves that are rearranged. Cali will often tell her mother "mommy, you look like you need a break and a cup of refreshing tea!” Followed by, “Don’t worry, mommy I can look after the till!" Wilbur Redwood has a brother, Merlot Redwood, who lives in Evergreen village with his family. They are wine farmers, and Wilbur is quite jealous of his brother's job. Fliss, isn't too fond of her sister in law, who also goes by the name Fliss, therefore she is trying to convince everyone in Sugarbush Valley to call her on her Christened name, Felicity. Father Alonzo as a child, wanted to be a dentist, but hated the sound of drilling. So it is a bit ironic that he is now a very successful builder. Mother Cassandra has qualified as a teacher, but is now a full-time Mother. With five children to raise, each having their own schedule of activities, she is constantly busy organizing them, picking them up or dropping them off somewhere. The children are older brother Mistoffeless, older sister Grizabella, brother Rumpus, sister Asparagus and baby sister Skimble. Mistoffeless (Stoffel) is your typical eldest child. His is introverted, organized and a great help around the house, especially to his father. Stoffel is already doing on the job training, because he wants to be a builder just like his father. In his spare time he likes to do magic tricks and entertain his younger siblings. Grizabella (Bella) is her mother’s right hand, and helps with the dinner in the evenings. She is also a quiet child, but more extroverted then her brother and will quickly speak her mind if someone is nasty to her siblings. Bella loves spending time with her best friend Tilly Dappledawn. 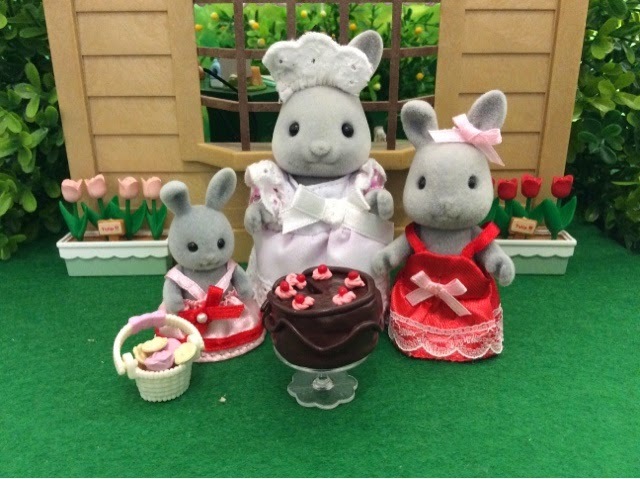 They are often trying out new recipes, Bella is quite good at this, and wants to be a master chef when she grows up. Sister Asparagus (Gussie) is definitely the fiery one in the family, and really gets worked up about any-and everything. Rumpus often tells her that she only has friends, because they are afraid of her. On the contrary, she has a small heart, but tries to hide this with her temper. Her mother and Bella know the real Gussie and usually ignore her when she complains about something. Although he will never admit it, Gussie is her father’s favorite. Gussie’s closest and best friend is Lauren Fisher. Brother Rumpus is a very mischievous boy and definitely the naughtiest of the bunch. He fears his father, but sometimes it seems that the only one that can really get through to him is Stoffel. He and Linus (Fisher) have caused chaos around the village many times and give their mothers endless headaches. Baby Skimble is just a darling little girl. She says the funniest things, which makes everyone laughs. According to her mother she has the best ears of all her children. Its just so unfortunate that she is extremely shy and will never repeat any of those funny things in front of strangers. Innes Bercher and his family just moved to the village from Mystique Valley, and left his beloved twin brother, Louis, and his family behind. To the delight of the village children they opened a toy store. The shop stocks the most amazing toys that have ever been seen under one roof and many of the village kids just pop in to look at the wonderful creations. Innes doesn’t mind this at all and loves to play … no “demonstrate” to the children how amazing every toy is. 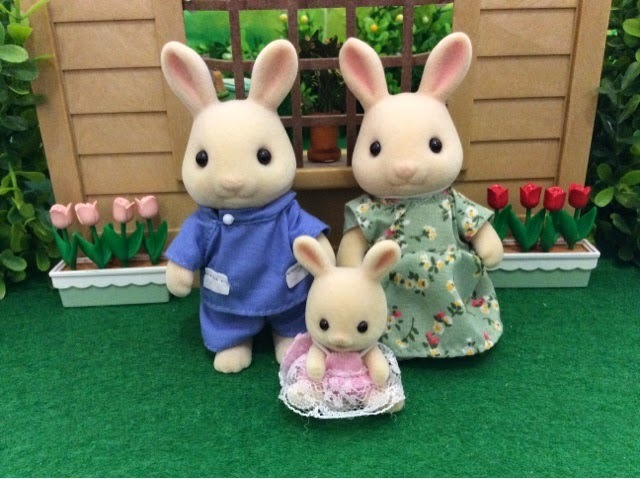 Mother Margaux also works at the shop and can always be found sitting at the counter browsing brochure after brochure to ensure that they have the best stocked toy shop in the region. Like her daughter she has a soft spot for the beautiful dollhouses, but the hand carved train sets also appeals to her. Brother Zander is always on the go, and as far away from his parents shop and the silly toys they sell as possible. He is likes swimming, hiking, or playing some sort of sports with his best friend Elliot. The only time his mother can get him to slow down is when dinner is on the table, and there are promises of desert. Sister Saskia likes to play with her large dolls house and furniture all day, every day. Her friend Shelley literally has to drag her by her hand to get her to do something else. 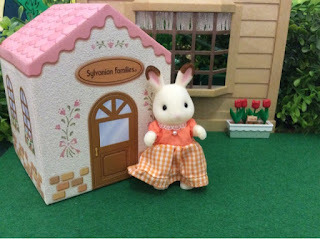 Saskia has made curtains and carpets for her house, and she is always on the lookout for miniatures that she can use. Baby Karissa loves to meet new people and make new friends. One will often find her on the counter of the toy store ready to welcome new customers. When a new family moves to town, Karissa will bug her mother if they have children her age as she can never have enough friends. She is always the first one to welcome them and ask them to come and play. Karissa is no longer the baby of the family anymore, now that Ciska is there, but she adores her little sister, but Cissy is only still a baby and doesn’t want to play. She only screams for milk or her mommy. The Timbertop family has been residents of Sugarbush Valley since the beginning of time. Taylor's father (Grandfather Gus) owned the general store in the village, but had to close it down when the village went through a recession many years ago. Taylor and Rose run a bike renting company and rely on the business of tourists who visit the village. It is Taylor and Rose's dream to one day reopen a general store like the one that Gus owned. Taylor is quiet, thoughtful and always easy to please, he wouldn't harm a fly. Though not well paying, he loves his job, especially exploring. He knows all the secret paths and hidden caves in the area. He and Herbage Dappledawn have an unofficial competition of who can discover the most unique spot in Sugarbush Valley. Rose is a very caring person who wants to sort out everyones troubles and problems. She is also an excellent business woman, and is constantly coming up with new ideas for their bike renting company. Bud or Buddy as his friends call him has inherited the best qualities of his father AND mother. He is quiet, always easy to please and on top of that wants to help everyone all the time, but put him on a football pitch and he turns into a little devil, who's loud, aggressive and will stop at nothing to score a point for his team. Unlike his family Burl is quite extroverted. He will strike up a conversation with everybody and anybody and are always ready for a giggle and a laugh. But like his dad he loves exploring. Like many others Bobby Roberts came to Sugarbush Valley by chance. He mentioned to his old friend, Edward Mulberry, that he was tired of The Big City and all its criminals. He desired a peaceful life, where his biggest concern would be naughty children and rescuing stray pets. The saying goes that you must be careful what you wish for, as that is now exactly the life Bobby is living, but he loves every moment. 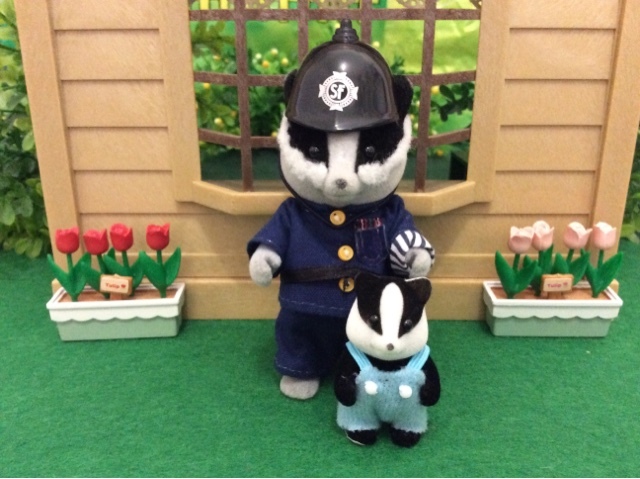 Though PC Bobby looks quite intimidating and fear-provoking, he is actually a jolly nice policeman. He always has a friendly word for everyone he meets and helps those in distress without hesitation, except if they've been naughty, of course! Hughie is spending all his time practicing magical tricks which he enthralls his young friends with. They all just love his, 'now you see it, now you don't ' as the vase of flowers disappears into thin air! As the son of the Police Constable he must just make very sure that he always make things reappear again. Bobby and Hughie lives in a small room on the top floor of the Commune. In his room he has quite a big collection of vinyls, and he often plays his twin brother, Bobby's favorite song if he misses him too much. Bobby lives in Marigold Creek. Father Aaron is a down-to-earth and hardworking carpenter. He specialises in making the most beautiful furniture pieces and takes great pride in his work. He is such a skilled craftsman, everybody in Sugarbush Valley can recognize his furniture, because each piece looks just like a work of art. Sorrel complements her husbands work perfectly by smoothing any rough corners, decorates them with a lick of paint if needed, polishes them up and puts new covering on it. As a mother she is practical and likes to get things done in the fastest most efficient way. Her brother, Marco Cotton, owns the Sylvanian Kitchen in Mystique Valley. Gromwell is the fastest boy in Sugarbush Valley and for that matter in the whole district. He has already won tons of medals and trophies and he wants to be a professional track runner when he gets older. Though three years older than him his biggest competition is Oliver Periwinkle and Branson Whiskers, but to date they have never beaten him. Comfrey just loves to watch his father at work, and given the chance, he'd pick up dad's tools and make furniture too! Father Harley was a world famous surfer. He won the world championships 6 times during his career. While he was riding the last wave at his 6th World Championships, he had the most unfortunate accident. He fell from his surfboard and broke both his legs and arms. Although he was still crowned world champion again that year, his broken bones never healed completely, and he could never ride as a professional surfer again. He was thus forced into early retirement. Although to young to "retire" he qualified as a life saver and swimming instructor. He obtained valuable experience on some of the world's most famous beaches. They have two children, the 10 year old Wren who is extremely shy and very attached to her mother. Her parents hope that she will meet a special friend soon, who will help her to be more outgoing. Little boy Rally, who is only 4, is very wise for his age and often tells his mother and father exactly how they ought to do things. Father Geoff runs the Sweets cart and popcorn wagon with his wife Shirley. He loves to treat the children, and leaves free candy on the counter everyday. It does however sometimes end up in a bit of a scuffle as the children just love to get their hands on the free yummy sweets. Shirley loves creating new candy flavors, and spend hours in her kitchen mixing delicious ingredients together like chocolate, vanilla, strawberry, and cherries. She makes the best gift baskets filled with pecan caramel clusters, chocolate covered almonds and dark chocolate truffles. 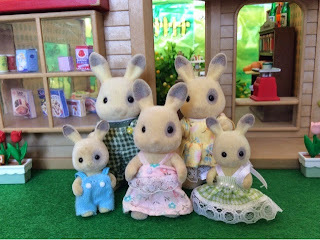 But like her husband she is very fond of children and loves to help them choose their favorite sweets. Sister Katie is always on the go. She wants to be a professional gymnast when she grows up. After she has done her homework, she practices her cartwheels, handstands, and back flips for hours. Her routines are incredible, and when others see her skills, they are amazed at how talented she is! Brother Simon is the opposite of his sister and is very calm and artistic. He likes to sit quietly and draw and paint pictures of outdoor sceneries. His favorite paintings are of the beautiful sunsets above the pond outside his window. Dew to his introverted nature he struggles to make friends, which isn’t helped by the fact the all his classmates are girls. Twins Bubbles and Bobo like to help clean up after their parents, licking the chocolate covered spoons and bowls. 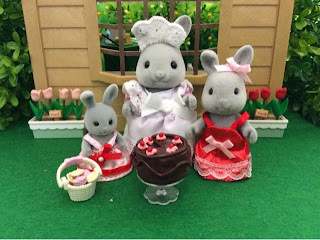 Shirley, their mother, is sure more chocolate and candy is put on their clothes than in their tummies, though! Brooklyn is a qualified banker but has had enough of the rat race of the city and after much discussion with his wife Kaitlin decided to quit his job and relocate to Sugarbush Valley. It is their dream to open a seafood restaurant on the banks of the river. Just like his nephew, Ben Henry-Lloyds, he loves fishing and sailing, and if at all possible he would like to literally catch the “catch-of-the-day” himself. But for now Brooklyn and his family will first enjoy a vacation in their new town. Kaitlin is extremely sociable and though she will miss all her friends and the book club meetings, she loves the quaintness of the little village and has already made a friend in Margaret Petite. 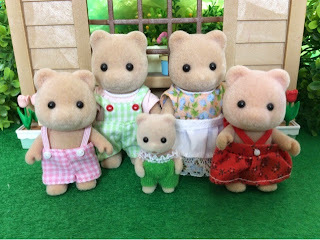 The couple has new born triplets, who are both adorable and are no trouble at all. They are very, very quiet. All they seem to do is eat and sleep, sleep and eat, which suits Kaitlin perfectly as this mean even more time for socializing. Rosetti Longfellow is a music teacher. He is actually thé famous Rosetti Longfellow, conductor extraordinaire, who has conducted many orchestras at famous performances. But with the birth of each of his children it got more and more difficult for him to leave them to go on month long tours with an orchestra. It was with the birth of little Clare that he decided to hang up his baton, and rather teach music, which had more normal hours. Rosetti plays many instruments of which the grand piano is his favorite, but he is also proficient in the violin, saxophone, harp and many of the different types of flutes. He hopes to establish a love for classical music in the students of Sugarbush Valley and is really happy to see the interest that many has shown in taking up music lessons. Rosetti has a sister, Diana Keats, who live in Glen Fallow with her three children. Bronte has never been this happy in her life. Finally they have a “normal” life. 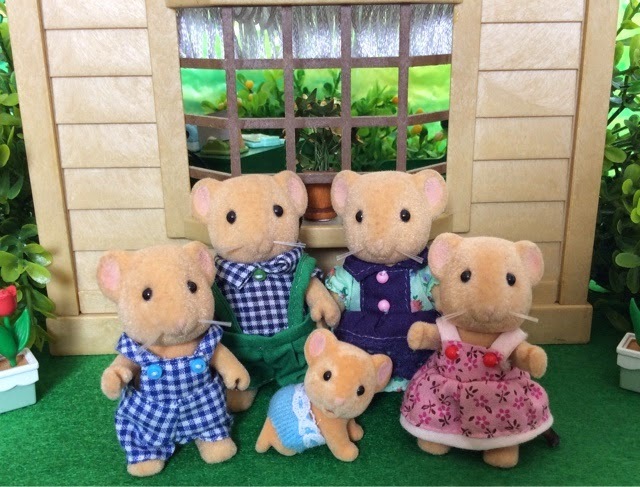 Her husband has a full time job with normal working hours, they have five beautiful, healthy and sometimes naughty children and she even has a job of her own as the junior teacher of Sugarbush Valley. She thanks her best friend, Margaux Bercher, every day for convincing her husband to move to this peaceful, little village. The couple has five children, T S Elliot, Shelley, Larkin, Clare and Dylan. Elliot likes village life, and together with Zander, they roam the area, always hiking, climbing or planning a big adventure. Shelley is a sweet little girl and though she misses the shops from her home town, she has realized that the shops in Sugarbush Valley is just as wonderful. 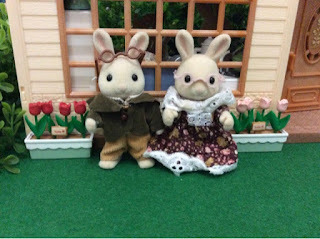 Gill and his wife, Ellema, finally took the plunge and decided to move to Sugarbush Valley. It was a decision that they have fretted over for very long, and being very cautious by nature, they were worried if they would be successful and happy in the little village. When Mayor Bill lured another ice cream maker to Mystique Valley, it was the final straw, and they packed up their belongings, and left behind life as they know it and their family. Gill's brother Andrew lives in Mystique Valley. The wonderful villagers of Sugarbush Valley has helped them to settle in nicely. Kenneth Furbanks found them a home and Mayor Trunk provided them with a prime spot for their soft serve ice cream stall. Though it is just opposite the square from the Buttercup ice cream cart, they have quickly learned that there is a market for both soft serve and scooped ice cream. The Brightfields have two children, Meshia and Briel. They are relieved to notice that Meshia has already made a new friend in Willow Cottontail and little Briel is adjusting just fine in Mrs Chiffon’s nursery school. Meshia likes arts and crafts. She can spend the day coloring with crayons and markers and she loves to decorate her room with glow in the dark stickers. Her favorite thing to do is make jewelry out of ribbons and beads. Little Briel loves ice cream, but are yet to decide, which her favorite flavours are. This gives Briel the perfect excuse to sample the hundreds of different flavours available again and again! Andrey is the dentist of Sugarbush Valley. He is newly qualified and Sugarbush Valley will be the first place where he will practice his trade. Andrey is a fun loving guy who loves life and now even more so, now that he has met the woman of his dreams, Blanka. Blanka Buttermilk (formerly Periwinkle, she is the younger sister of Alex) is a tough one to get to know. She is never the same and due to the fact that she has a sharp mind and always ready with something quirky and even sarcastic to say, many people misunderstand her. But under the tough exterior is a shy girl who just want to be happy and cared for. Blanka feels lucky that she has found someone like Andrey, and she just knows that they will be very happy. Heike is a sweet baby who often climbs into her father's lap when he is reading a book and holds her mother's leg while she is cooking dinner. She is very fond of her grandfather, Mack Periwinkle, but she has hard time fighting off her cousin, Hannah Periwinkle, for his sole attention. Andrey has a brother Boris who lives in Mystique Valley. After a terribly sad life Suzette Simpkins has found some happiness in Sugarbush Valley, although she is always smiling she is a stranger to most and that is exactly how Suzette prefers it. The only person that knows her true life story is her brother, Maurice, who is also the only person that Suzette trusts. Many stories has been spread about the early death of her husband OR that the twins have been left on her porch by a stranger when she was a youngster herself, but none of these have been verified, and will probably never be. Suzette tries to forget about her past life by organising the most amazing kids parties in the region. Every last detail is important to her and nothing gets overlooked. But though she loves her small business, the most important thing in her life is her two children, the twins Glynn and Gwendolynn, for whom she would do anything. Glynn and Gwendolyn Simpkins are two adorably sweet kittens who have exceptional manners. They live for Saturdays when they usually help their mother to organize some friend’s birthday party and love to dress up in their best party outfits. It’s the thought of the delicious birthday cake, the brightly coloured balloons, party hats, the beautifully wrapped presents, and sending and receiving of birthday cards which make them love birthday parties so much. Marion Brighteyes is a highly acclaimed wedding planner, known for her unprecedented style and innovation. No detail is too small when planning her clients most important day. Her business slogan even is "It must be a dream come true!" Marion’s meticulous organisational skills, dedication, and a love of her work are only a few of the traits that suggest to the bride-to-be that Marion will handle everything, and that she may relax. 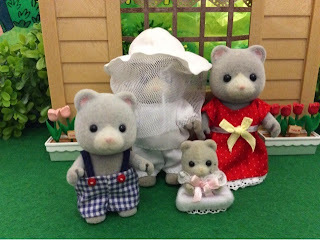 Due to her great success Marion gets a lot of requests and because she struggles to say no to potential clients, she has decided to leave Grinpa in search of a quitter more peaceful life, she still handles one wedding a month, but the rest of the time are spent with her girls, Charlotte and Olivia. 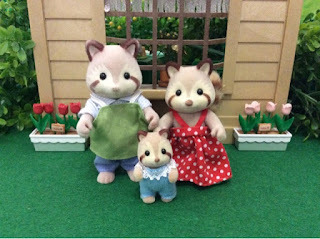 Marion misses her brother, Peter, who lives in Evergreen Village, but he has Belinda now and she makes him happy. She just wishes she could say the same about their sister. 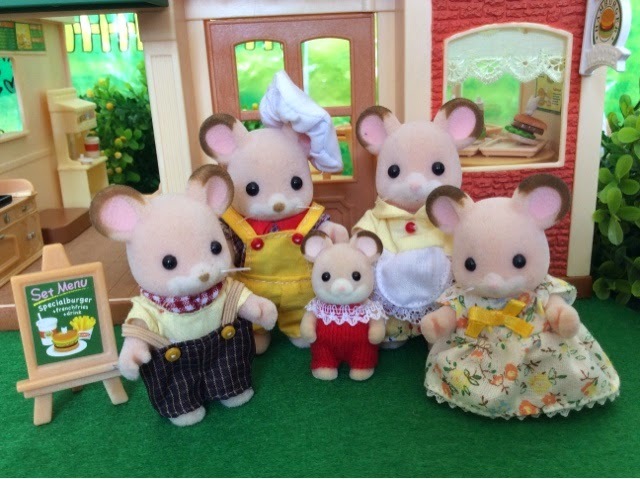 Charlotte would like to be a wedding planner like her mother when she is older, so she likes spending time helping her mother at work. In the evenings she likes to design and create new ideas for wedding dresses, cakes and flower decorations! Though only eight years old she comes up with amazing ideas of which her mother has even used a few of. Olivia is a ballerina, or rather she dreams of being one. She is up early every morning, practicing steps which means Marion can never have a lay in. Olivia is still small and obviously not as nimble as a true ballerina should be, but she is very cute to look at, so her mother doesn't mind waking up early. 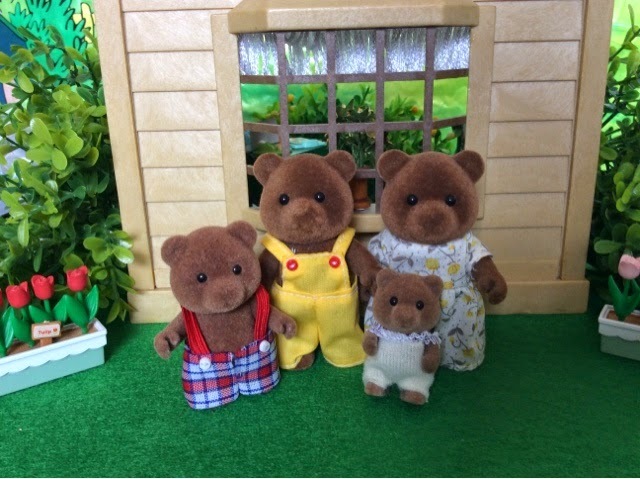 Bruno Bearbury is a honey farmer, who have learned the trade from Horace Honeybear of Mystique Valley, where he has worked the past 10 years. Recently, he received a very lucrative and appealing offer from Mayor Hugo Trunk to come and farm with bees on Highfields farm, on the outskirts of Sugarbush Valley. Both Bruno and Irene loved the idea and accepted the offer immediately. Bruno is a very shy man and prefers to hide under his honey-farmer uniform and be kept company by his bees. Irene is not shy at all, and can’t wait to spent time with her best friend Sorrel Cottontail, who she has knew from their school days in Mystique Valley. She will however miss her sister, Olive Butler dearly. They have two children, Owen and Harriet. Owen is already a familiar face in Sugarbush Valley as he has visited the Timbertops a few times in the past. The family will live in an old refurbished stable on Highfields farm. Owen is an energetic little boy, and always up to some mischief! Together with his best friend Bud Timbertop, they have done a lot of things that gave their mothers a few grey hairs, but they are never nasty to anyone, and Owen will always do something good to make up for his mischievous nature. Baby Harriet is a shy little girl just like her father, but she loves her brother and follows him everywhere, even though it frustrates her, as crawling is not as fast as running! Arthur has a particular soft spot for carpets and rugs as there are so many wonderful designs! He is a master craftsman, making the most beautiful, colourful rugs that Sylvania has ever seen!. Sitting at his loom, surrounded by wonderful, complicated designs, Arthur creates his masterpieces in delicate coloured silks and cottons on sturdy jute strands. Mother Cecilia Teak, designs a lot of the intricate patterns that her husband Arthur uses in his rugs. After her son’s death she has however been struggling to get inspired and these days prefer to curl up with a good book in a sunny place. She can spend hours reading romantic novels in the sun’s warm rays, oblivious to the world around her. Sadie Teak is pretty-in-pink and loves make-up and making herself look extra nice. She thinks that her mother is the most beautiful cat in the world, and often picks out a dress because she thinks that her mother would like it. She’s got plenty of tips for applying make-up from her mum and is constantly trying out new fun looks. Baby Sister Bonnie Teak is a bit like a magpie because shiny things are always catching her eye. This could be anything from a pretty candle to some tasty looking jelly beans. But she likes to hold onto these treasures and watch them for hours, sometimes holding them in her paw. Unfortunately chocolate melts and she often gets mucky from holding too tight onto her sparkly treasures. Livvy Bramble is a self confessed gypsy and has always been some of an outcast. Until she came to Sugarbush Valley. Here she found peace, accepted her lifestyle, realised the villagers accepted it too and decided to settle in the beautiful village. Livvy is still deciding what kind of work to do, so in the mean time she does odd jobs in the village. Max is a bubbly boy who loves life. He is helpful and always tries his best to be a good boy so that his mother can be proud of him. Since their first meeting Max and his best friend Muddy Mcburrows has been inseperable. Thx Nicky ... This is my favorite part greating and adding to the bios. SOme of it is totally new but I like to keep something of the original bios. If Teri just want to show up, but her plane must be delayed somewhere. The bio is ready, will be interesting what you will think about it! I see, the Puddlefords have already an important role in Sugarbush Valley, it fits them very well, I like this idea very much! This is the best introduction i've ever seen. 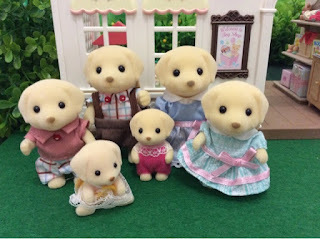 Thx, yes the babies are very cute, sometimes to cute that is why most families have babies, I just cant resist buying them. Want to do a trade for the trunk baby? Or you can just pay via paypal too? Looking forward to hearing from you soon! Wonderful new bios! While I was reading, I had a big smile on my face. Your villagers are so friendly. I'm curious about Margarets beauty salon :). Glad I could bring a smile to your face. My pleasure and I feel honoured that you are having a look around. Enjoy it. Amazing site! I love all their stories. 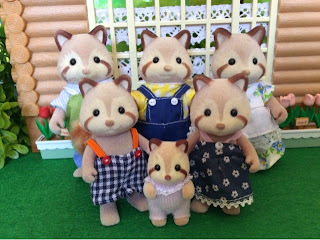 I'm desperately seeking a Mulberry raccoon baby to complete my daughter's family - any tips on how to find discontinued characters? I have only discovered your blog now. I get the idea that you are also from South Africa. I knew about Ladylollipop, but was not aware of any other local collectors. I only started collecting last year August. I have all the current available figures and am now struggling to get the discontinued ones. Yes I am. I'm on a bit of a hiatus at the moment, life just got too busy. What figures are you looking for specifically? I have a few extra figures but they're not in orignal clothing or no clothing at all.